Have you ever heard this rhyme? As a young mother in the Great Depression, this saying typified my grandmother's experiences. Even though the time she spent in abject poverty was short-lived, it altered the way she looked at the world for the rest of her life. Grandma didn't throw much away. Bits of string were carefully wound around the old-fashioned bottle opener to save for later. Tinfoil pieces were re-rolled. Knee high nylons were mended multiple times. Margarine tubs became containers and the lids morphed into coasters for plants. Growing up, my mother never had a chest of drawers to hold her clothes, only a wooden orange crate that had been tipped on its side and fitted with a curtain on a spring to hide the contents. Every once in awhile, grandma would splurge and buy store-bought bread to use for a picnic. After the picnic, the sack was carefully washed for reuse. Grandma had a great eye for beauty and painted amazing landscapes before her vision deteriorated. A travelling photographer came out to the farm to take pictures of the homestead. Grandma purchased a large portrait that showed the house, her gardens and some of the closer outbuildings. I looked closely at it one day and noticed that she had taken a paintbrush and added color in the section of the picture with her flower gardens. Apparently it wasn't yarrow unless it was yellow. It made me smile. Trust her to look at something and try to invent a way to make it more beautiful. I had to channel that attitude to improve the disaster I was handed at our August quilt guild meeting last year. My guild holds annual challenges and this year our challenge was to make a mini quilt. 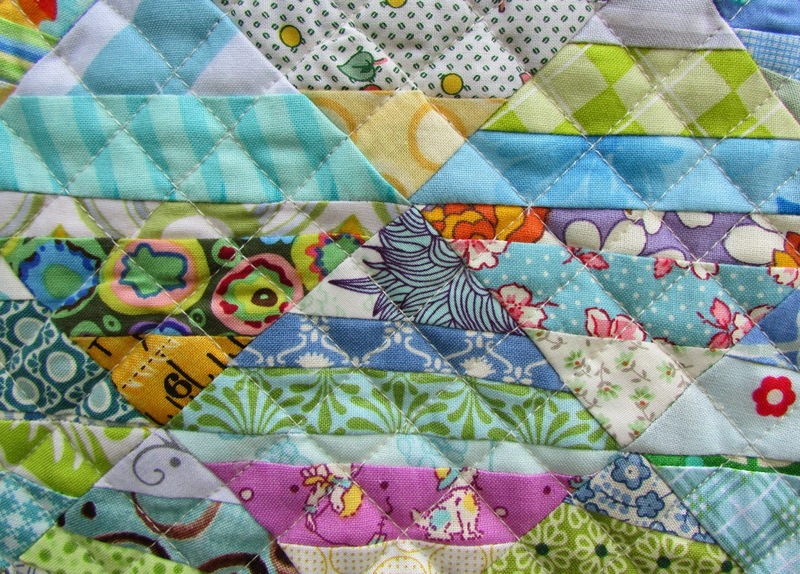 The first option was to make a mini quilt with any fabrics we wanted. The second option was to make a mini quilt that used bits of all the fat quarters we shared with our table groups on the night of our opening activity. These are the fabrics from my table. Ugh. You know how sometimes there are fabric groupings that just need one more fabric addition to unify the collection and make everything seem purposeful and harmonious? Yeah, this isn't one of those. There is only one thing you can do in a situation like this........and that's throw more fabric at it. LOTS MORE FABRIC. Before I go any further, I should tell you why I shared the Great Depression stories about my Grandma. I am a saver too. I am able to control this tendency in most areas of my life that are outside of the sewing room. Inside the sewing room, all bets are off. Not only do I save EVERY scrap, I also have them broken down into various subsets. I went through every scrap container and pulled fabrics that I thought might work with my duds collection. With the exception of 3 fabrics, I did not repeat any fabrics in the project (I really regret those three times and can spot EVERY SINGLE ONE OF THEM). I used a quarter square triangle ruler to make templates out of newsprint from the Sunday paper and used them as a foundation for string piecing. Each of the little triangles are two inches tall. I added an envelope backing to give myself a display option with this quilt. It finished at 14" x 14" so it can be a pillow or a wall hanging. 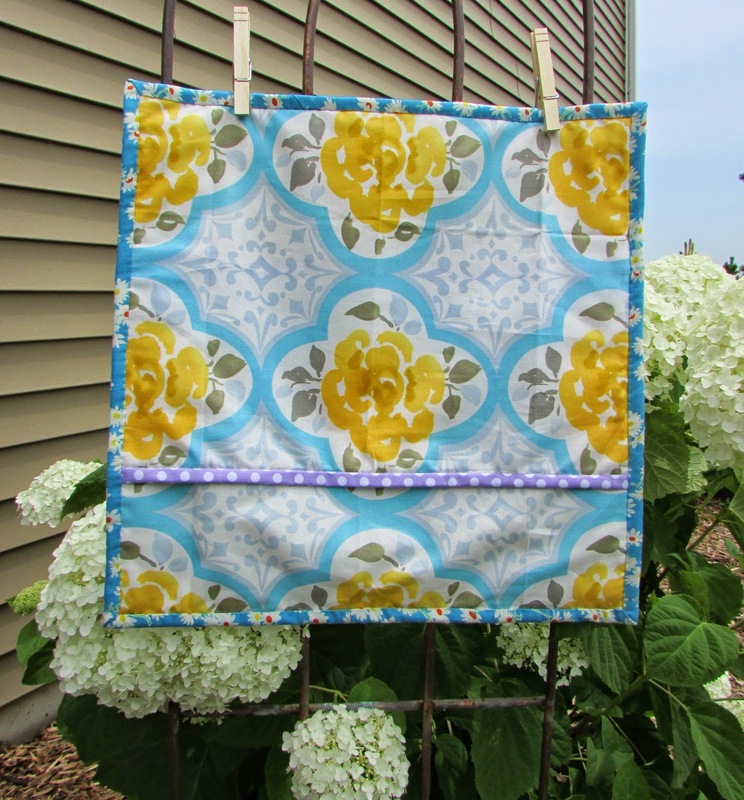 I chose a print with yellow flowers as another nod to Grandma and bound it with a 30s feedsack reproduction print. 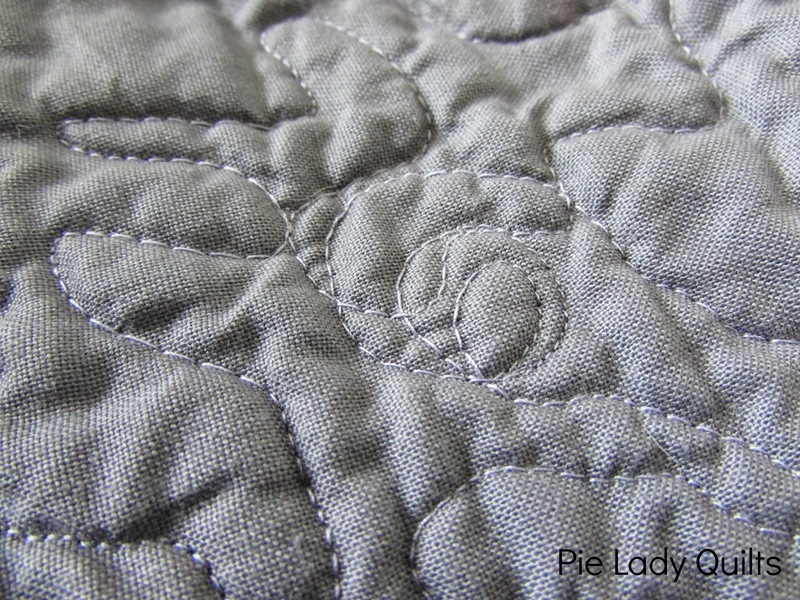 I used a scrap of wool batting I had and quilted it with an off-white Aurifil thread from my collection. I thought of Grandma the whole time I made this quilt, so I named it after her. This quilt didn't cost me one red cent to make. I think she would appreciate that. First of all, I have some housekeeping items to clear up. 1. Banana Runts are just plain nasty, and that's the truth. 2. My daughter is 15 months old and has very interesting grooming habits. Tonight she ate her portion of Mayocoba beans and promptly smashed the rest of them into her shirt, hair and various other crevices. My brother patted her curly head and said, "Hmmm, crispy," (just in case you needed independent verification). Bananas are particularly fun to smash. 3. I will eat a banana that is crunchy and kind of hard to peel. My husband dies a little every time he sees this. On the other hand, my husband will eat bananas that reek of ethylene. I gag a little every time I smell this. Together we cover the full banana spectrum. #3 was the fib. I had a great time reading all of your guesses! I also had a great time making this quilt. A friend of mine asked me to make a quilt for a special occasion. She told me that she liked a star in the middle. That's it. Isn't trust a beautiful thing? Believe it or not, I do occasionally make quilts that aren't purple. Apparently I just haven't gotten radiant orchid out of my system yet. I have to say that I am thankful for my burgeoning orange stash. Orange fabric might not be fun to buy, but it is fun to use! Something magical happens in the pairing of orchid and orange. I really like this color combo. 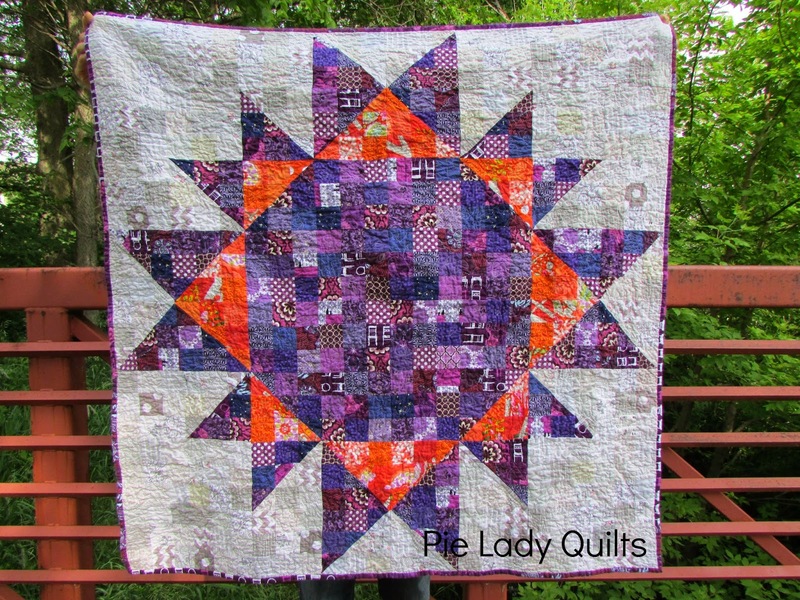 This particular quilt is made from a variation of a Wheel of Fortune Star. I modified the block to make each solid piece in the original a nine patch and every half square triangle in the original into a split nine patch. Each completed block finished at six and a half inches. I started free motion quilting in December. My mom is a maker too (which also makes her a championship fabric and quilt kit buyer). I stole one of her quilt kits when I was visiting last summer to take home and do for her. I gave it back for her Christmas present. That quilt was my first attempt at free motion quilting and I am pretty sure I ripped more stitches than I sewed. Secure in my knowledge that mom would love me even if my quilting was marginal at best, I persevered. I am glad I kept trying. The hardest part about free motion quilting is letting go of any illusions of perfection you might be harboring...sort of like getting your first ding in the brand new car. I tried a new design for this quilt. I threw a little loop and double loop into the meander. Some of it was pretty flippin' awesome. ...and some of it, well, wasn't. Whoops. Since the flippin' awesomes outnumber the whoops moments, I am counting that as a win. Hopefully I get karma points for showing extra large detail shots of the quilting. 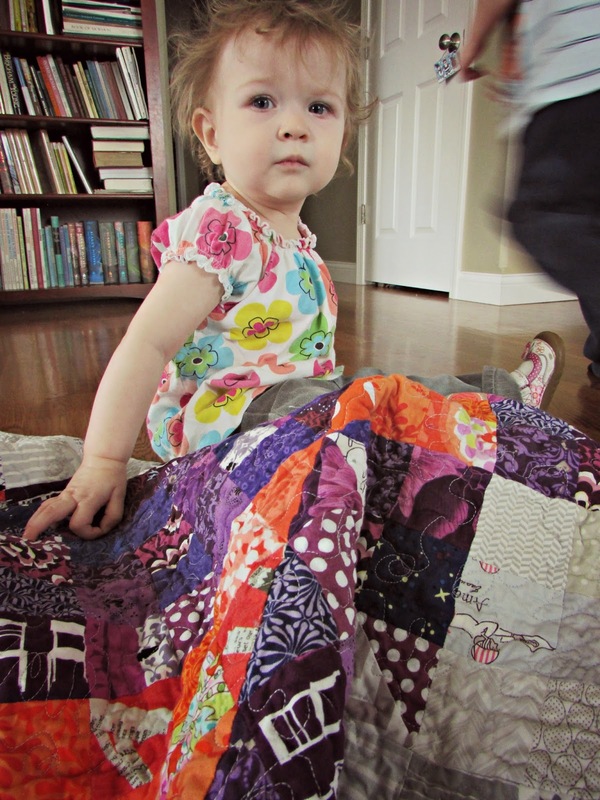 Here is a picture of our sweet little "Sister" trying out the quilt. Check out the hairstyle! If you had hair that routinely looked like this, you'd try the banana gel too. And this is a picture of the back. I contented myself with the simple heart. Not every note has to be written with (ransom note) letters. I know what you are thinking. Pie Lady? Really? I will let you in on a little secret. I am not the world's biggest fan of pie, but I am pretty good at making them. It has become an annual tradition for me to enter and win our local pie competition at the county fair. 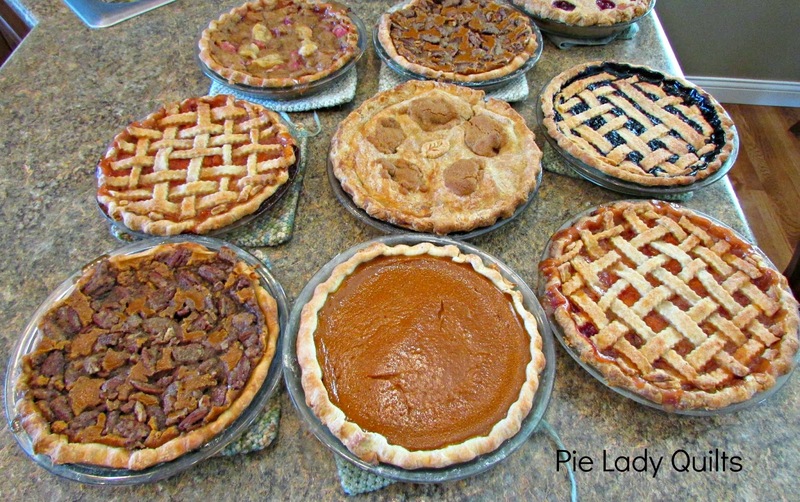 When I brought home some more trophies last summer, it was my husband who commented that I was turning into a "Pie Lady" and it just sort of stuck. If it were up to me, I would be Awesome Cupcake Quilts or definitely Warm Chocolate Chip Cookie Quilts, but Pie Lady just sounds better. Speaking of sounds better, here is a link for the best chocolate chip cookie (It's the Cook's Illustrated version, thick and chewy) you'll ever put in your mouth. Trust me, I've put plenty of them in my mouth. 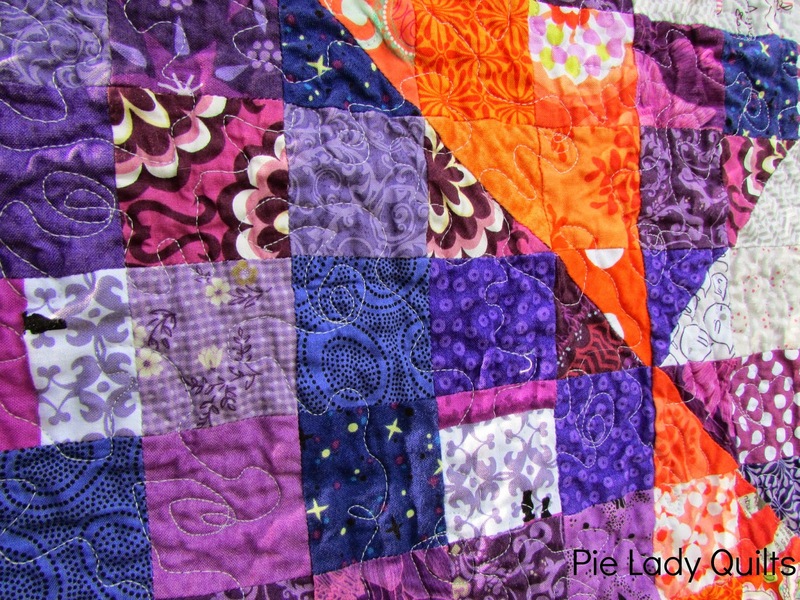 I approach quilts like I approach pie. I research the heck out of traditional methods, practice it, and then try to find some way to innovate or update it. I ask "what if?" a lot. I think about quilts the same way. I seem to think about quilts all the time. My little boys have seen these zone outs quite a bit. I never realized how much I did it until they started saying "that would make a great quilt" when we looked at illustrations in their picture books or they stopped to point out some colors to me on our walks. Both of them will sit on my lap for far longer than any normal 6 year old and 4 year old boy would, looking at illustrations of block designs. The ladies at my local quilt guild laugh at the way I check out book after book from the guild library. I am a self-taught quilter and I am hungry for knowledge. I don't care if the book has a modern slant or not. I look for techniques and inspiration everywhere. I created a collage of the three entries I made for this year's Pantone Color Quilt Challenge (radiant orchid). These projects are a good representation of who I am as a quilter. I have full blog posts for these projects if you are interested in more information. The first is Radiant Triangles. Going through my drawer of rulers one day, I saw my Tri Recs ruler. I looked at it hard and wondered what else I could make it do. 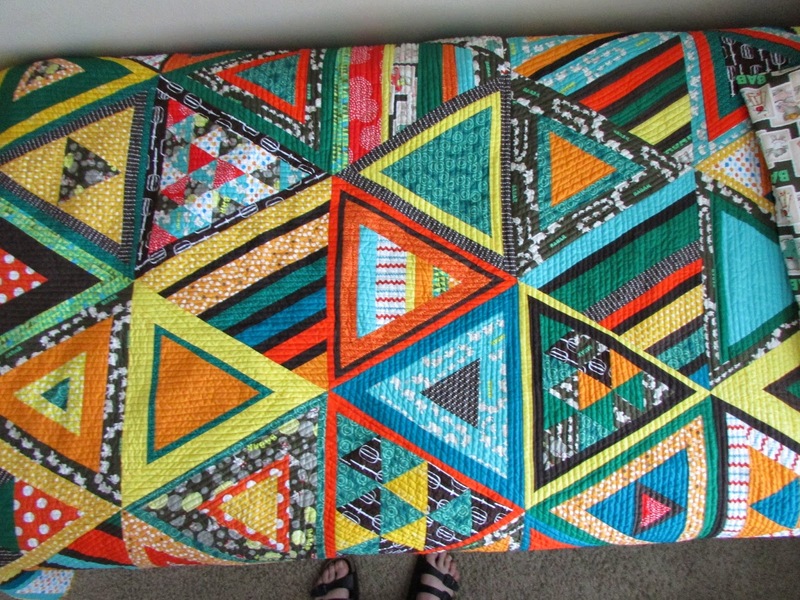 I had just finished an improv log cabin quilt and wondered, "what if I use the triangle as the center of a log cabin?" The second is Radiant Improv. I wondered what would happen if I combined a traditional block with improv piecing. The last is Radiant Circles. I love curves and wanted to try my hand at sewing them, so I folded a piece of typing paper and cut a curve. I made a pillow to practice sewing that curve, and when it worked, I committed to a quilt. 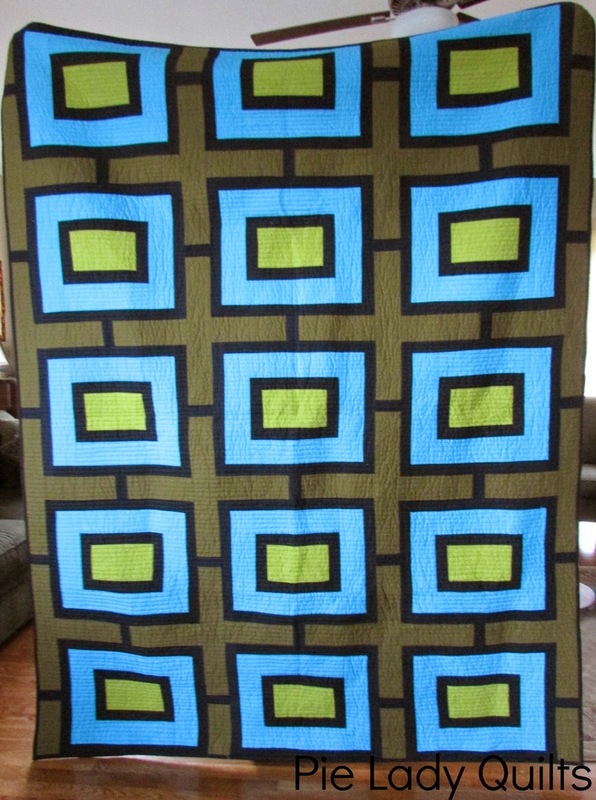 The next project I wanted to share was a quilt I made called Mod Boxes. I drew this out on graph paper with my feet dangling in the community pool last summer. I had a baby last spring, so I had a companion snoozing away in her carseat. My husband and I took turns watching her under the shaded awning and playing with the boys in the pool. 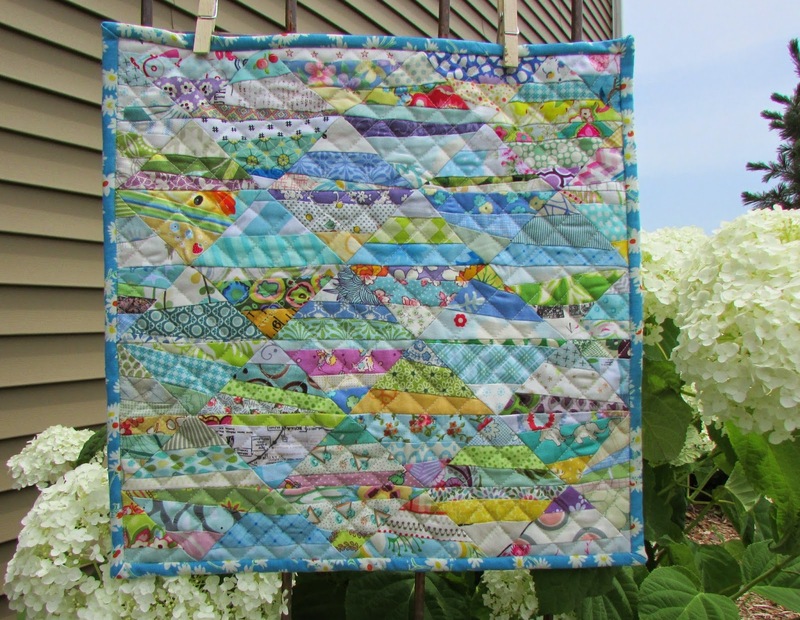 The colors of the pool and shade seeped into the color inspiration of this quilt. I just love Kona Water. Pretty literal, huh? Most of the time, I don't order specific fabrics for specific projects. I had a moment of clarity when I heard Bill Kerr from Modern Quilt Studio give a presentation at our quilt guild. He said, "Ugly fabric can be effectively utilized in a quilt." When I went home and looked at my stash, I realized that a.) he was right and b.) My stash reflected my personality TOO heavily. 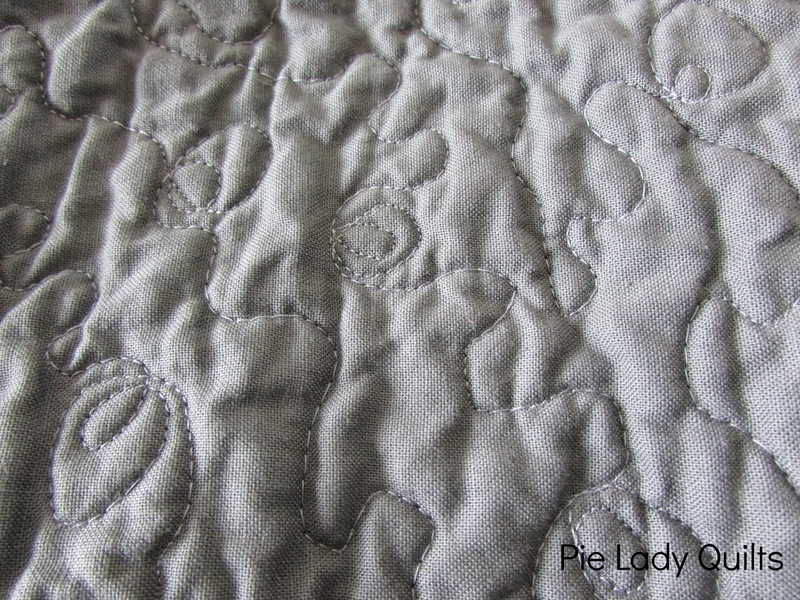 I had lots of splashy fabrics, but not enough of the understated, "drab," workhorse fabrics that make a cohesive quilt. Plus, I had glaring gaps in the colors. Apparently yellow, blue and orange fabrics are NOT fun to buy. I have worked hard in the last 18 months to correct that problem and develop a more well-rounded stash with added design possibilities. My solution? I've stopped picking out most of the fabrics myself. Scrap packs are a fantastic deal. 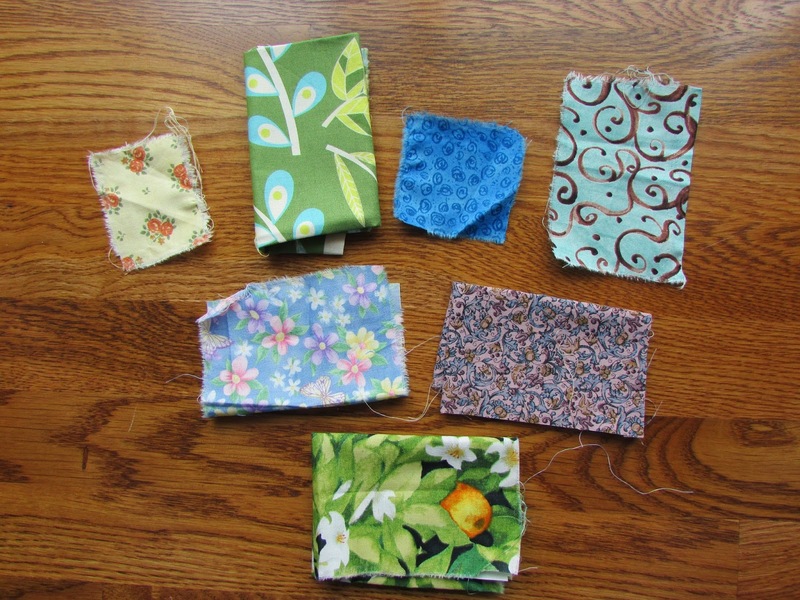 My LQS in Hills, Iowa (Inspirations) has them and Hawthorne Threads has great scrap packs online. The other thing I do is put my mom on the case. She goes to her LQS in Preston, Idaho (Suppose Quilt Boutique) during their semi-annual sale and picks up the $0.99 fat quarters for me. So often, the most, um, "interesting" fabrics are the ones that make it into the next project. Don't believe me? Look closely and you'll spot the dark brown fabric with giant white egg beaters. Yep, giant white egg beaters. Thanks, mom! So today, thanks to modern technology, I am posting this blog en route to my mom's house. To keep me company through Wyoming, and distract me from the realities of a 1200 mile road trip with three children, I thought I'd try one of the games I used when I taught 4th grade. It's called Two Truths and a Fib. I will share 3 statements about me; 2 are true and 1 is not. Can you spot the fib? Tell me your guesses and/or write one of your own. Bonus points will be awarded to anyone who makes me laugh out loud. Since far too much of this post has been about food, I thought I'd continue the theme and besides, quilting IS bananas......"and bananas is good!" 1. I despise any banana-flavored candy, especially Runts. 2. My daughter makes a unique and long-lasting hair gel out of smashed bananas. 3. I once told my husband that "I only eat bananas that are brown and smushed." Enjoy the rest of the blog hop and thanks for stopping here!